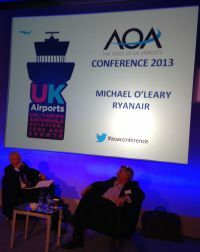 Monday and Tuesday of last week was taken up by the UK Airport Operators Association (AOA) annual conference, at its now regular venue, the London Hilton Metropole, close by Paddington Station. The general opinion confirmed that it was probably the best ever. Opening the gathering Ed Anderson, Chairman of the AOA, highlighted the Airport Commission but feared that that politicians would not act on the commission's recommendations, which will be published after the 2015 General Election. He introduced the new Minister of State for Transport, responsible for aviation Robert Goodwill MP (See BTN 14 October). His was a prepared speech which could have easily been said by predecessor Simon Burns. At least it was positive saying: "There is now a debate about where expansion should take place, not why it should take place at all". In true ministerial style he refused to take questions pointing out it would be "foolish to pre-empt its conclusions" (of the Davies report). A Keynote Address was given by Jon Moulton, the venture capitalist, and a Guernsey resident. It was controversial. He emphasised that we were obsessed with airport security and he reckoned it was costing half a billion a year. He says some of the money could be better spent on say the health service, saving more lives (he said that no single villain had been comprehended last year at this colossal cost). No security on Canadian internal flights and no problems. In his view some of the regional airports should be shut. He quoted Newquay and indicated that should be closed, somehow forgetting that Cornwall was even more cut off than Guernsey in some ways. As Chairman of Aurigny (see BTN 19 August) he was asked by BTN why the airline is buying an Embraer 195, with all the complications of a single aircraft operation rather than wet leasing, which could work out cheaper in the long run. No response. There were three sessions leading off with “The Industry Challenge”. Jim French, Chairman of Flybe, again emphasised that if Heathrow is to have a third runway services from UK regional airports need to be ring-fenced. Laurie Price, now retired from consultants Mott McDonald and a past Aviation Adviser to the House of Commons Transport Select Committee, pointed out that some of the submissions to Davies were not good in failing to recognise that it is airlines that decide not airports or mayors and few failed to recognise the crucial importance of air freight. “The Policy Challenge” was highlighted by Sir Charles Montgomery, Director General of the UK Border Force, who emphasised that improved traffic flows at points of entry was a priority. The agency has the funding to increase staff levels next year. The “Industry Leaders Question Time” ACI Europe’s Director General, Olivier Jankovec, explained that by 2035 some 20 airports in Europe will face the kind of congestion that Heathrow has today. This will cause a further ripple effect across the airport network and the capacity crunch will cost airports and airlines more than €40bn in lost revenues and €5bn in congestion costs, annually. 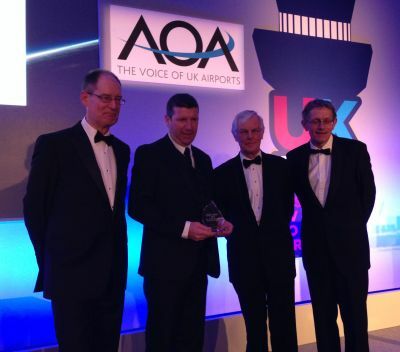 Genially hosted by one time aircraft ‘spotter’ Simon Calder of The Independent, the AOA Annual Awards ceremony on the Monday evening saw Edinburgh Airport win the prize for Best Airport over 6m passengers, and Leeds Bradford for under 6m passengers. The second day, in fact just the morning, turned out to be something of a comedy session with all three participants, Michael O’Leary, Sir Howard Davies and Willie Walsh, in that order, trying to score points. 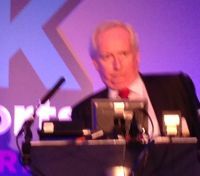 The BBC’s John Humphries adjudicated with the two airline bosses in a “Hardtalk” style discussion, but more congenial rather than confrontational. Sir Howard came in between the two. Not a bad idea. Who won the battle of the Irish? If a film is ever made of the O’Leary phenomena (and BTN is reading the official Tony Ryan biography) who would play the part of Michael? Perhaps Mr Douglas of the same name with a change of accent. O’Leary has an answer for everything but this time round was out manoeuvred by his contemporary Willie Walsh with a short amusing video on cabin service. Michael was in the new so-called friendly Ryanair mood. He was appearing in front of what he called “the robber barons of aviation”. He then admitted to being part of the establishment and compared himself to Robin Hood with an odd remark saying he was now “The Sheriff of Nottingham”. Nice man turned rogue, or the other way round. A member of the audience noted “a leopard does not change its spots”. In any event the Dubliner said that he would be announcing a whole raft of improvements over the coming months (see Ryanair relaxes) which would include a business fare with change facilities, extra reserved seats, family and group products and more relaxation regarding on-board bags policy. His ambition is still to run a low-cost North Atlantic airline, but not from Dublin. He says the ideal aircraft is the Boeing 787, but it costs too much and none are available. With regard to Prestwick, a major base for the airline with engineering facilities, he would like to work with the Scottish government, but was wary. Willie Walsh was in an attacking mood blaming the politicos for all the woes of the airlines. That may be true but in a practical sense you have to get on with them. Willie Walsh will certainly not win the war with Westminster (nor the Spanish establishment). He was very clear in stating that Heathrow would never have a third runway and emphasised that Iberia would make an operating profit next year. When pushed to give some indication regarding a real return on the investment he refused to say. He was keen to praise Vueling which IAG purchased earlier this year. Sir Howard was in a most congenial mood and clearly feels happy in front of an audience of aviation professionals. No lobbying from the NIMBY’s (not in my back yard) this time around. He more or less followed the line of his recent presentation once again emphasising that additional runway capacity is required in the South East and that his December report would include better use of existing capacity and improved surface access. He said that he would not be bringing his final conclusions (due after the 2015 election) forward and expected the party leaders to follow the recommendations.